Often a newly developed radio in the small and feeble world of DRM (also supporting the persistent good old AM..) has been announced, but hasn’t made it outlast an initial patch. For the TITUS I hope this will be not true, although in March 2017 I have not perceived any concrete ads in my special DX-magazine RADIOKURIER here in Germany. But the set looks promising, including AM and DRM on all the bands from 100khz longwave (where software addenda maybe could enable it to decifer RTTY maritime weather forecasts) (the Indian AVION does not incorporate longwave and I don’t know if the GOSPELL does). I am not a technician, but to me it makes sense to use ‘everybody’s darling’ cellphone technology to have reasonably priced processors. I will gladly put my old Himalaya 2009 aside if the TITUS comes up and performs… . The only question is if the near extinct DRM usage (just a Brittany based ‘smartcast’ DRM experimental transmitter has been added recently in the ever shrinking broadcasting hours in DRM) one day will gather momentum. The more robust xHE AAC technology deserves it.. . I have several questions not answered anywhere in the brochure or web site. Apologies if I sound impatient. Am I correct in assuming this is a zero IF radio? What are the s/n ratios by band? What is the bit width of the D/A converter? How do you keep the hash generated by the CPU and rest of the system from overloading the front end? What is the frequency stability and drift? Can it be tethered to (eventually) an external GPS to improve stability? Will there be an RDS display for FM? Will FM offer mono/stereo and what used to be called “hi blend”? Will the software offer intelligent band scanning? IE, looking for a new signal on a previously quiet frequency? Do the antennas have diodes protecting the system from casual jolts of static electricity? Is a “standby” feature possible, so this unit could be paired with a 5-10 watt transmitter for portable operation on the ham bands? the TV band to allow AM to become FM, using no added spectrum, but sharing spectrum with TV. Richard, AM is useful where it is due to coverage issues. MW effectively covers rural and small communities that are not served by FM or television, and at a lower cost. If the Seattle AM stations were to switch to the TV bands, they could not be received on the West side of the Puget Sound, forcing consumers to pay for free spectrum reception via cable or satellite. Oh Boys ….. everybody ready to criticise …. it’s certainly cheaper to just spit out the first thought that crosses your mind, than to actually MAKE a phisical [product that, in my opinion, has the chance of revolutionising the market. Yes, I admit I would have designed the enclosure differently, but that is just my personal taste. And in any case, it’s ok like this, at least for now. I for one, I’ll certainly buy one and may be many more of those, if it really is what is advertised (which I have no doubt it is). Niche market? May be. I personally do not think so and I do not care. I think it’s a BRILLIANT idea, one that has the potential to KILL many many many other radio manufacturers and to revolutionise many aspect of how radio and TV is delivered and consumed by the Public. And that might be one of the reasons behind some of the nasty comments. Can’t wait to lay my hands on it! 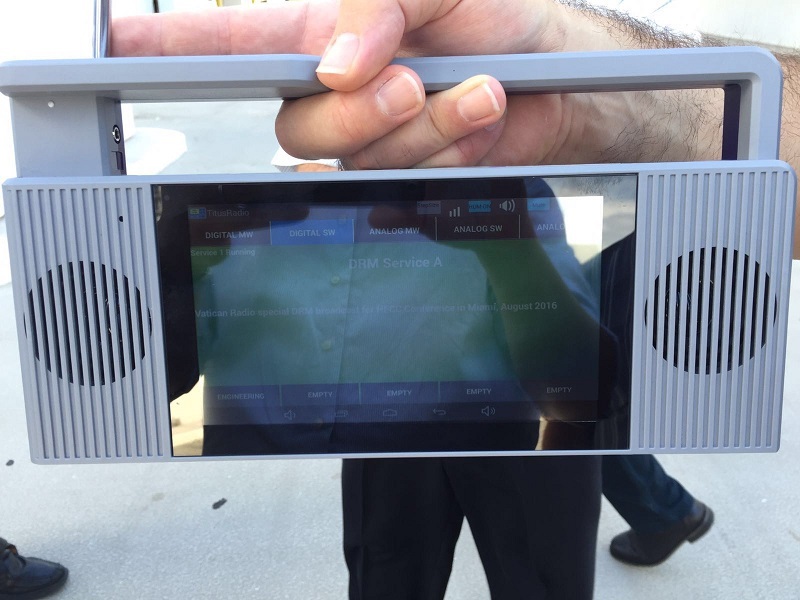 The builtin microphone (ref :http://titusradio.com/tablet-features/ ), makes me think that it is a repurposed android phone board, which is an excellent design design decision to keep their development time and price low. There is one number missing from their RF features (ref: http://titusradio.com/rf-features/ ), and that is how much bandwidth is available for raw IQ. Since the titus2 supports FM this implies that it is at least 114kHz, but with a Mirics chipset I’m guessing that USB 2.0 bandwidth is the limiting factor. 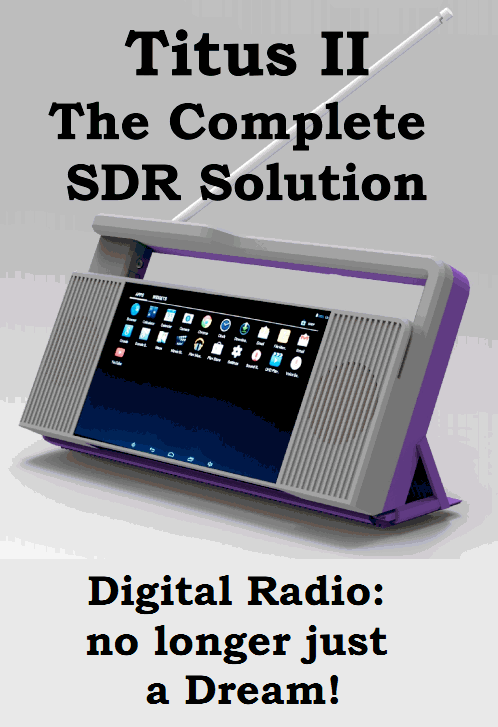 Certainly looks vastly different from any SDR I have seen, like the styling very much. Definitely thinking out of the box as far as the design goes. Good frequency coverage, and at that price certainly seems to be a game changer. Wish them the best of luck and hope they sell lots of them. Could be cool. If going to the trouble to put speakers in I hope they sound good. always love comments from people who have never designed or produced anything and their guesses. Titus is for real, the unit shown at hfcc was in an injected molded housing (I would love to see a 3D printer make such a housing). Production is staring by years end. We have been at it for two years now. We have the ability to produce 500kpcs/month. The broadcasters are serious, governments are serious, listeners, we are serious! The is no need to search for finances, perhaps you do not know about free trade zones like Panama and Hong Kong and their usage in worldwide distribution. Sorry Marcinkus, you simply do not know what you are talking about. SWL listeners are a niche market, but one in which we are very happy to be in. The extra glare is because the picture was take outside in full sunlight in Miami while receiving a special DRM broadcast from Rome – noise and static free without drop outs. Stay tuned, Titus is changing what ‘radio’ is ! @Mike, I appreciate your comment. But what about the RTL-SDR sentence that says, “Rumour currently has it from word of mouth of the developers that this unit will priced “well below $100 USD”. What can you say about this? What about schematics etc? We in the evolving consumer SDR environment can tolerate a LOT when it comes to closed-source non-disclosure provided the product is low in price, but if you’re going to charge a premium for this product, then you NEED to open-up the design. Otherwise it is DEAD in the water (IMO). And don’t forget – having an open design helps the product to evolve due to user contribution. Let the Community of users help evolve your software WITH you. You concentrate on making the hardware affordable and streamlining the fulfillment supply chain that feeds your customers. With volume comes profit. For example, you said: “SWL listeners are a niche market, but one in which we are very happy to be in.” You are wrong, if your device is affordable and programmable by your customers, your market is FAR more than just SWL Listeners. Just keep in-mind one critical thing: RF Emissions Compliance. Commercially a product like this outside of, say, Mainland China, WILL require EMI testing. This is where you may run into problems. Consider L.O. leakage (as well as other sources in your design such as clocks), this is especially the case with direct conversion quadrature SDR designs. I wish you the best of luck – really! yes price is ‘well below usd100’ – sch really you would not be able to hack anyway so dense! As others have suspected our main market is not the hobbyist or SWL guys – just like RTL is not. Being an analog / digital multi-standard broadcast receiver has a huge potential market. The international HF broadcaster know as do the MW broadcasters, all would like to go digital – now they can. As I said, SWL is a niche market, not our main market obviously not depending on it for any real volume, but as a long time hacker, want you guys to play too. At the price, you can not afford not to play! Well said Mike. Yes i was just guessing of course but i hope to be seen as the guy who called Titus founder to come to talk to this blog’s community rather than the guy who was guessing without knowing anything. Interesting to hear how the project is developing but when you say “SWL listeners are a niche market, but one in which we are very happy to be in”, i hope that with a target of 500kpcs/mo. you don’t rely on the RTL and SDR enthusiasts for more than .1/100 of your production. With 500kpcs/mo. or 50kpcs/mo. we are totally irrelevant but if you still think that this irrelevant market segment is worth to be followed to make it grow consider that only a small part of us are SWL/BCL, otherwide we would buy a “decent” equipment (many of us have that one as well). We stay with the dongles and small SDR because we are basically hardware hackers and experimenters. We experiment antennas, we write software (not me…), we test software, we decode data, and the SDR allow us to do all this. What do you have to offer to keep us involved with your gear? If just unaccessible hardware, an audio jack output and a closed software i’m afraid that they will not be enough to break through. I am not making a request but just suggesting something to think about. I wish you all the best for the success of your business. Keep on rockin’! Radio hobbyists, especially shortwave broadcast and utility listeners will be glad to pay <$100 for a portable standalone SDR that can do multi-mode decoding. And , they won't be interested in "hacking" it. They'll be too busy listening to it. Hurry up, Mike. I need two units now..
> The broadcasters are serious, governments are serious, listeners, we are serious! > SWL listeners are a niche market, but one in which we are very happy to be in. This product fills a big gap in the market for low-cost digital shortwave* broadcast receivers, but you need a wider product range to jump start the digital broadcasting industry. This can be accomplished by making a separate tuner with a bluetooth link for a smart phone, so the customer does not have to pay for a built-in tablet & audio amp if they dont want it. We also need a networked tuner with a WiFi / Ethernet / USB interface that can serve up a stream to multiple desktop & mobile clients through the home router. NVIS or satellite broadcasting methods could also play a significant role in the digital radio revolution. DRM is by no means limited to the shortwave bands! Wow that looks great if it works out with your price target. If you make it hackable, you’ll get lots of interest from the SWL and ham market. It may be niche but look at the RTL-SDR, most people I know have several. I have over 10 of them myself. So when you estimate market interest don’t count just the number of users. And indeed the design looks too polished for a 3D print. I do a lot of 3D printing, both with commercial services and home printing. Looks like the carrying handle can slide down? I seem to see a little locking stub on the left hand side. Nowadays 3D printers allow to create prototypes with minimal investment and present them to HFCC conference in Miami in search of financers. This project is far from being put into large-scale production and the location of the company is more suitable for movements of money than hi-tech designers. It ‘a project aimed at a niche market almost inexistent and whose profitability is more tied to the needs of the operators of the broadcasting industry than to the law of supply and demand. The screen looks like it will have extra glare. I’m puzzled why a radio developed in Panama, supports DRM (Digital Radio Mondiale) and not HD Radio (although the licensing fee to iBiquity for that would probably add another $50 to the price). I would love to see the schematic for the receiver to see how they are doing the turning .